designer beth fuller sent over one of her new eco-friendly designs- the zipper wine bag. each bag is made from organic fabric and an all-natural dye (wine!). beth designed the collection as a graduate student at pratt this spring with the goal of creating a product that served a dual purpose. 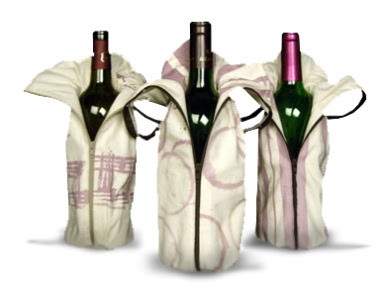 the wine bags can be used both to sell wine in retail settings and can be reused by the consumer. i love the idea of reusing something and taking what would be an imperfection (the wine stains) and incorporating it as part of the overall pattern and style of the bag. you can click here for more information on beth's zipper wine bags.